Discerning photographers, both professional and enthusiast, have long valued the advantages of a fixed-focal-length prime lens over a zoom. While zooms are more convenient for lots of photographers, primes offer a number of advantages, the foremost of which is image quality. Yes, it’s true that the optical performance of zoom lenses is constantly improving, and we’ve seen some outstanding zoom results in Part 1, but the best prime lenses always outperform a zoom. With fewer glass elements, the quality of the light hitting the sensor isn’t diminished as much with a prime as it is with a zoom. This improved light transmission not only ensures a brighter viewfinder, but produces sharper, crisper images, too. What’s more, with fewer elements, the glass in a prime is more precisely aligned and calibrated to much better control other factors such as Vignetting, Distortion, and Chromatic Aberration. Prime lenses offer a number of other advantages as well, such as affordability, portability, and creativity. With less glass, primes are generally lighter and smaller than a zoom, which is both handy for portability, but also more suited to certain photographic subjects. Take street photography, for example, where a small prime will help you work discreetly, or social portraiture, when sticking a large zoom lens in someone’s face can be off-putting. For creative effects and working in low light, primes often offer “faster” maximum apertures at more affordable prices. Take the new Canon 50mm f1.8 STM, for example, which at just $125 won’t break the bank for many photographers. That “fast” f1.8 maximum aperture is really going to help in low light, allowing you to use lower ISO sensitivity and faster shutter speeds. For creative effects, a wider aperture also makes it easier to throw the background out of focus and produce attractive bokeh, too. A prime lens will make you think about your composition more as well. While zooms can make photographers a bit lazy, with a prime you’re going to have to work harder, and often those limitations will help expand your creativity. Split into six categories, ultra wide-angle, wide-angle, 50mm, short telephoto, long telephoto and macro, here are the verified results for the best prime lenses on the Nikon D750. On full-frame sensors an ultra-wide-angle lens is defined as having a focal length of 20mm or less, and is an important lens for architecture and landscape photographers. For architecture, and particularly for interiors where space can be restricted, the ultra-wide field of view ensures that you can fit everything in. Rectilinear ultra-wide-angle lenses also keep lines straight, particularly useful for professionals so that their images don’t suffer distortion as they do with fisheye lenses. Ultra-wide-angle lenses can also be used creatively for more dynamic images however, as they exaggerate the space between the near and the far. This makes them popular with landscape photographers who want to emphasize something in the foreground to make it look big and dominating — an unusual and dramatic effect that can also work well with portraiture or product photography. We’ve analyzed images using seven ultra-wide angle prime lenses on the Nikon D750, and scores range from a low of 19 points on the Sigma 14mm f2.8 EX Aspherical HSM to a high of 30 points on the Nikon AF-S 20mm f1.8G ED. Click the links to read available reviews for these lenses. 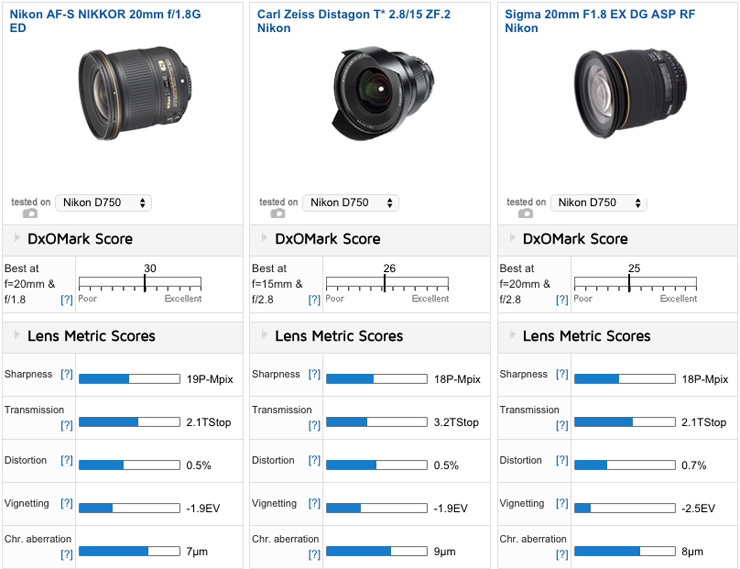 The Nikon 20mm f1.8G ED wins with 30 points, clearly ahead of both the Zeiss Distagon T* 2.8/15 ZF.2, in second place with 26 points, and the Sigma 20mm f1.8 EC DG ASP RF in third with 25 points. 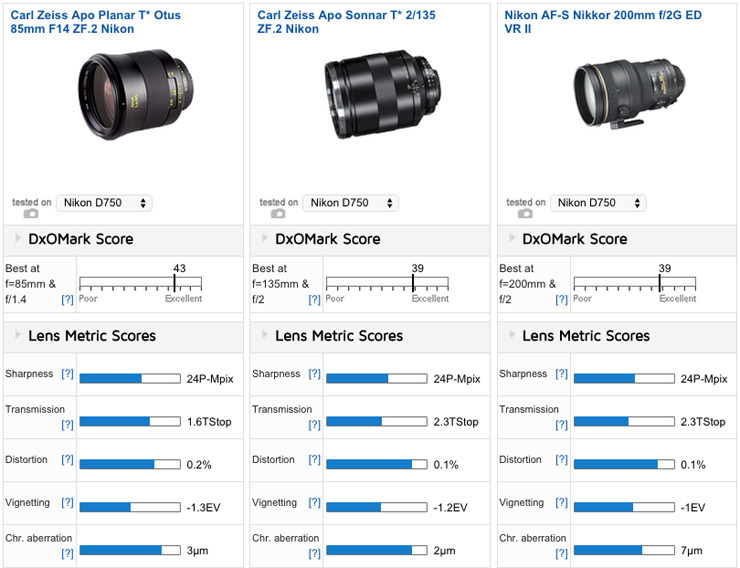 The Nikon is either ahead or tied in all lens metric categories, and for the crucial metric of Sharpness, barely beats the competition, scoring 19P-Mpix compared to 18P-Mpix for the Zeiss and Sigma. At f/2.8, there’s not much between the Nikon 20mm and Zeiss 15mm, with both offering good levels of uniform sharpness compared to the Sigma 20mm, which drops off in the corners. At the minimum aperture setting, the Sigma 20mm is more homogenous across the frame, but isn’t quite as sharp as either the Nikon or Zeiss. If you need a wider angle than 20mm and can’t afford to cough up $2950 for the Zeiss, then the $319 Samyang 14mm f2.8 IF ED UMC in fourth place with 25 points represents the best value option for the money. Like the Zeiss 15mm, the Samyang 14mm is a manual-focus-only lens. If you’re looking for an autofocus lens wider than 20mm, the $1249 Nikon 14mm f2.8D ED is a good option, although with a score of just 20 points on the Nikon D750, it’s a little further down the ranking for image quality. At f/2.8, the top ranking Nikon 20mm and Zeiss 15mm ultra-wides offer greater and more uniform sharpness compared to the Sigma 20mm, which drops off in the corners. At minimum aperture, the Sigma 20mm’s sharpness is now uniform across the frame, although it’s not quite as sharp as the more expensive Nikon and Zeiss lenses at this setting. If you don’t need an ultra-wide-angle field of view, then a 35mm wide-angle focal length is very versatile for lots of subjects. It’s a popular focal length for many wedding photographers or environmental portrait photographers who want to show their subjects within their surroundings. Lightweight, portable, and offering a generous field of view, it’s also used a lot by street photographers who often want to work quickly and discreetly, and by travel photographers who want good-quality images without lugging around really heavy kit. 35mm primes are a great low-light option, too, as wide maximum apertures such as f/1.8 and also f/1.4 are common and relatively affordable. 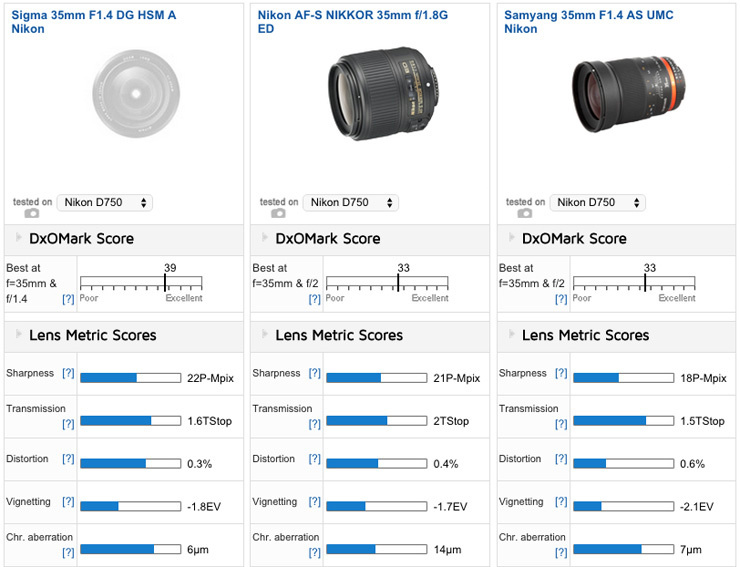 The verified scores from seven 35mm primes on the Nikon D750 range from a high of 39 points on the Sigma 35mm f1.4 DG HSM A to a low of 25 points on the Nikon 35mm f2D. With 39 points, the Sigma is the clear winner, not only well ahead of the 35mm competition but also one of the best-performing lenses we’ve tested. Ranking in 41st place for ALL camera/lens combinations, the Sigma is also joint third on the Nikon D750, beaten only by two significantly more expensive Carl Zeiss options. Sitting in Sigma latest “Art” range, as the A in its name denotes, among pro primes, the Sigma 35mm f1.4 A offers a maximum f/1.4 aperture for artistic effects, and at $899 represents a great value for the money. The Nikon 35mm f/1.8G ED and Samyang 35mm f1.4 AS UMC are joint second with 33 points, and while the Samyang lens is the cheapest and also boasts a wide f/1.4 aperture, it’s manual focus only. 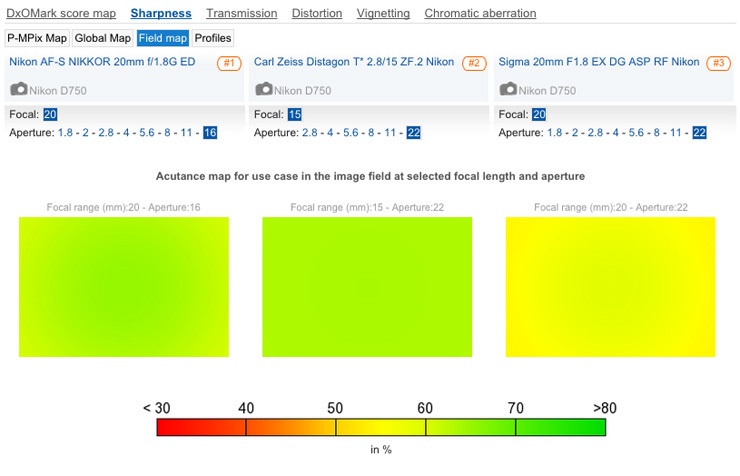 In terms of the individual lens metric scores, the Sigma wins for Sharpness, Distortion, and Chromatic Aberration, but isn’t too far behind for Transmission and Vignetting, too. In terms of sharpness, the Sigma 35mm f1.4 A offers high levels of uniform resolution at all aperture settings, with the slight exception of f/1.4 where, although still very good, the edges drop a tiny bit. The Sigma is both sharper and more homogenous at f/1.4 than the Nikon 35mm f1.8 is at f/1.8, and although the Samyang 35mm does offer uniform resolution at f/1.4, it isn’t as sharp as the Sigma. At the other end of the aperture range, the Sigma 35mm again comes out on top with stronger field map results than its competitors. At f/1.4, the Sigma 35mm f1.4 A is sharper than the Nikon 35mm f1.8 at f/1.8, and despite a tiny drop-off in the far corners, is impressively homogenous across the frame. At the minimum aperture setting, the Sigma 35mm wins again with greater levels of resolution than the Nikon and Samyang versions, and it is more uniform, too. The 50mm focal length is often referred to as a “normal” or “standard” focal length in 35mm terms. That’s because on a full-frame camera, the 50mm focal length, with a field of view of approximately 46 degrees approximates human vision (if you exclude peripheral vision). 50mm is also the shortest focal length that doesn’t distort perspective in the same way a wide-angle lens does, thus keeping elements in proportion. 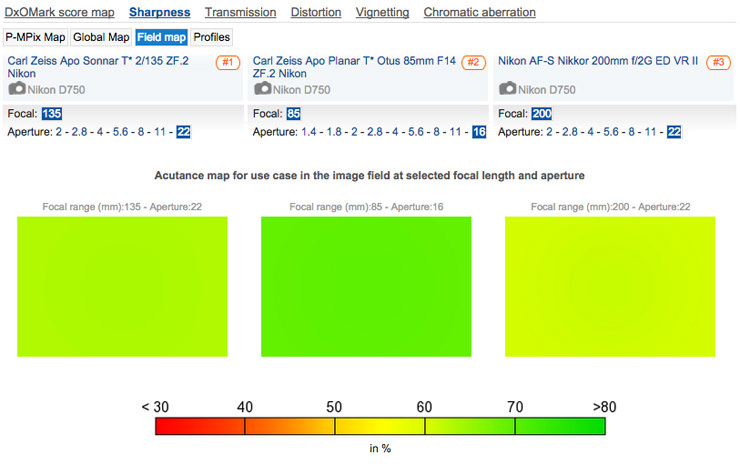 That makes 50mm a good focal length for portraiture, and particularly for full-length portraiture. This said, for tighter ¾- or ½-length portraiture and particularly for standard headshots, most photographers prefer between 85mm and 135mm on full-frame cameras. Many of the same arguments for 35mm lenses apply to 50mm primes, too. They’re relatively cheap (except for the Carl Zeiss Otus!) lightweight, portable, and with “fast” apertures create attractive background bokeh, and are good in low light. 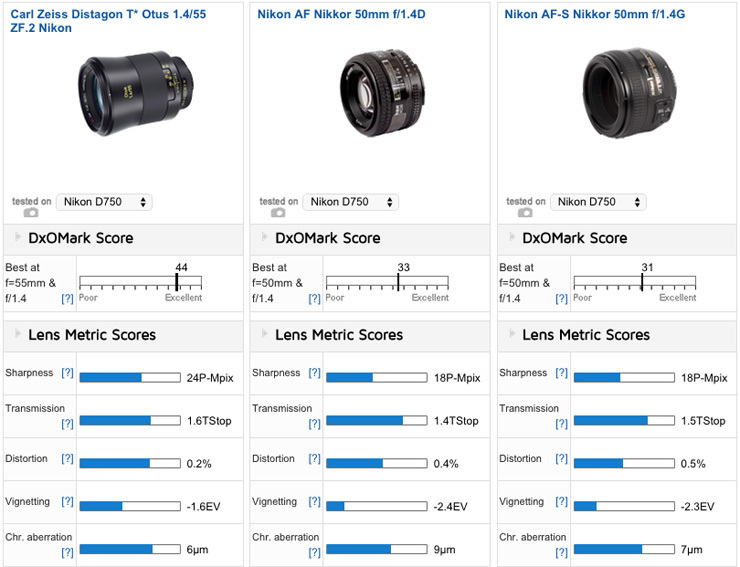 We’ve tested eight 50mm primes on the Nikon D750, with scores ranging from an astronomic 44 points for the Carl Zeiss Distagon T* Otus 1.4/55 ZF.2 to a low of 25 points on the Carl Zeiss Planar T 50mm f1.4 ZF.2. With an overall DxOMark Score of 44 points, the Otus 1.4/55 prime lens is miles ahead of the Nikon competition. 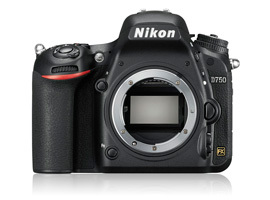 In fact, it’s one of the best lens we’ve ever tested, reaching a score of 50 points on the Nikon D800E. On the D750, it ranks 6th for all lens/camera combinations, behind only lenses attached to the higher-resolution Nikon D800 series cameras. Costing $3990, it’s over 13 times more expensive than the second-place Nikon 50mm, but if you need the best of the best at 50/55mm, the Otus 1.4/55 is the one to get. With 24P-Mpix for Sharpness, the Carl Zeiss Distagon T* 1.4/55 ZF.2 Otus delivers the maximum sharpness possible from the Nikon D750’s 24Mp sensor. Sitting alongside five other lenses from Nikon and Zeiss that also score 24P-Mpix for sharpness, the Otus 1.4/55 is the lens with the widest field of view that records maximum sharpness. 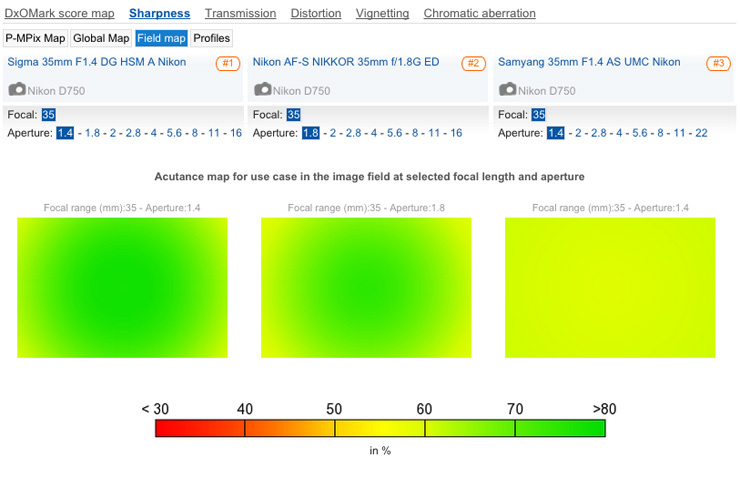 So as you’d expect, it’s razor sharp edge-to-edge at all aperture settings between f/1.4 and f/16, in contrast to the 50mm f1.4D and f1.4G competition from Nikon. 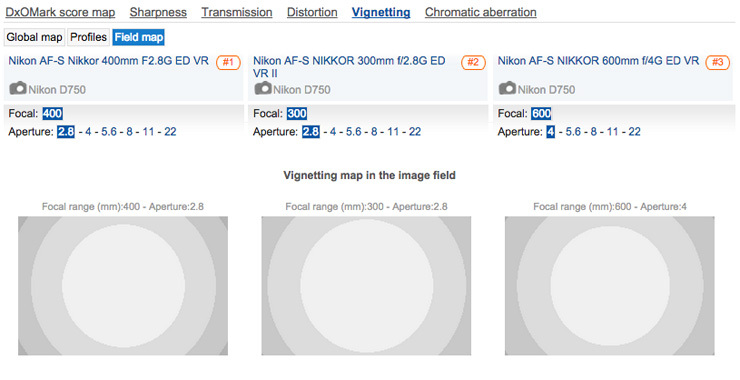 Although significantly cheaper, neither of the 50mm Nikon primes offer good or uniform sharpness at f/1.4. In fact, the older Nikon 50mm f1.4D version isn’t homogenous across the frame at any aperture setting on the D750, which is disappointing. The Otus 1.4/55 wins in most other lens metric categories, too, offering less Distortion, Vignetting, and Chromatic Aberration. The Otus 1.4/55 isn’t a small and compact prime lens like the Nikon competition, however, and obviously packs a lot of glass to facilitate its razor-sharp results, giving it technically the worst Transmission score, but there’s barely anything in it. The Otus 1.4/55 offers outstanding uniform sharpness at all aperture settings compared to the Nikon 1.4D and f1.4G versions, neither of which are as strong as the Zeiss at maximum aperture. 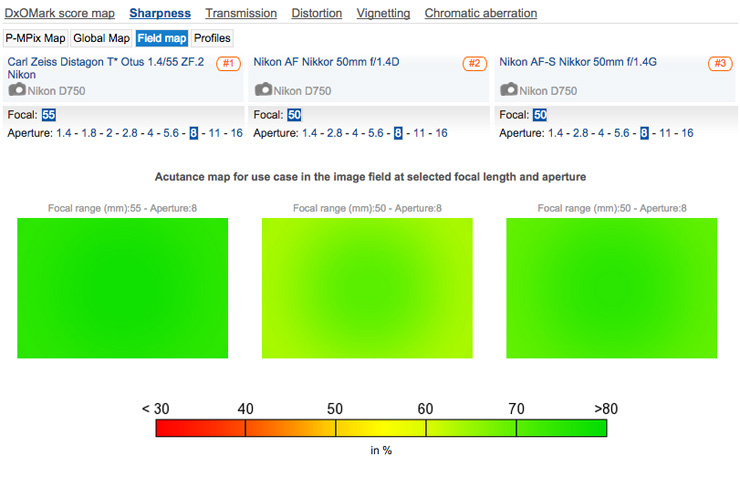 In fact, while the Nikon f1.4G version offers homogenous sharpness at apertures between f/5.6 to f/16, the f1.4D version isn’t totally uniform at any aperture. A short telephoto prime is ideal when you want to fill the frame when shooting your subjects from a little distance so you’re not on top of them. For natural reportage at events and weddings, a short telephoto helps capture proceedings organically as they unfold, without distracting or interacting with your subjects. They’re good for studio-based fashion, too, with focal lengths between 85mm and 135mm ideal for ½- and ¾- length shots if you have the room. On location, portrait and headshot photographers will shoot towards the longer end of the telephoto focal length between 135mm to 200mm to achieve compressed perspective and backgrounds that melt away into a blur using “fast” f/2 or f/1.4 apertures. We’ve tested ten short telephoto primes on the Nikon D750, covering focal lengths between 85mm through 200mm. 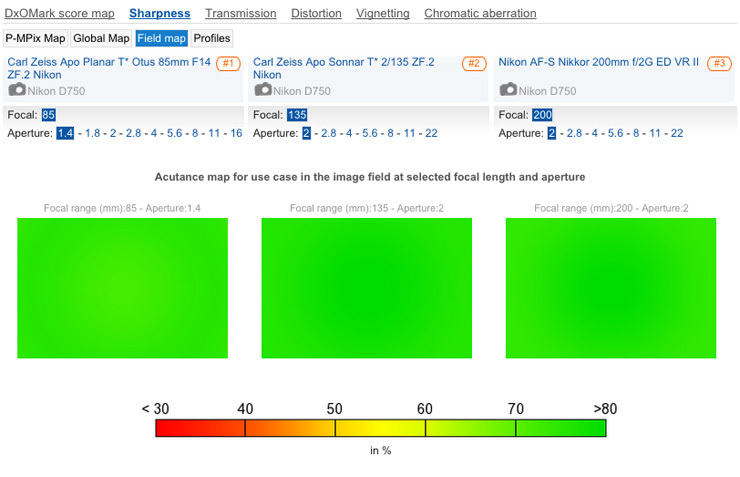 Scores range from a very respectable low of 32 points on the Nikon AF 85mm f1.4D IF through a high of 43 points on the Carl Zeiss Apo Planar T* Otus 85mm f1.4 ZF.2. With an outstanding score of 43 points, another Zeiss Otus lens proves itself as one of the best on the Nikon D750. The Apo Planar T* Otus 85mm f1.4 ZF.2 is the second-best lens we’ve ever tested, just behind the Zeiss Otus 1.4/55 that we’ve just discussed. Those scores were achieved on the higher-resolution Nikon D810, however, and attached to the Nikon D750, the Otus 85mm f1.4 ranks 12th for all camera/lens combinations in our database. All of the top three short telephoto lenses deliver outstanding results, all ranking within the top five lenses on the Nikon D750. 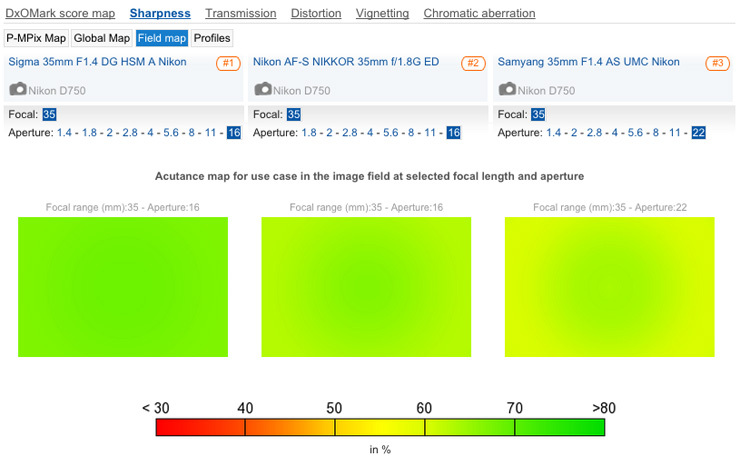 Lens metric scores for these lenses include the maximum sharpness possible of 24P-Mpix on the 24Mp Nikon D750 sensor. This means they resolve with both outstanding and uniform sharpness at all aperture settings, with the slight exception of f/22 on the Zeiss Sonnar T* 2/135 and the Nikon 200mm f2G, which are still very good but drop off just a little. This level of optical performance comes with a hefty price tag, however, and the Nikon 200mm f2G is the only one of the three lenses to feature autofocus. If you’re after a slightly more affordable 85mm lens with autofocus, the $1,599 Nikon 85mm f1.4G deserves a honorable mention, ranking 4th for short telephoto primes on the Nikon D750 with a score of 39 points. Although its sharpness is still excellent, the Nikon 85mm f1.4G posts a slightly lower score of 22P-Mpix, as it isn’t quite as sharp at the maximum aperture setting of f/16. Shooting at the maximum aperture of f/2 or f/1.4 for amazing backgrounds on your portraits, all three short telephoto primes deliver excellent edge-to-edge sharpness. Excellent sharpness is maintained by these lenses through the aperture range, with results at f/22 on the Zeiss 2/135 and Nikon 200mm f2G dropping just a tiny bit, but still very good. Long telephoto prime lenses help photographers with restricted access get much closer to the action. Big, heavy, expensive and cumbersome to use, they’re really the preserve of professional sports, wildlife or press snappers whose jobs rely on filling the frame with the action. The “fast” f/2.8 or f/4 apertures are needed for working in the low-light environments that news and sport photographers often find themselves in, and help them shoot with fast shutter speeds to freeze the action. 300mm and 400mm can be used for portraiture, too, and by news and event snappers, who need to fill the frame with a subject at a press conference. At 600mm, paparazzi photographers can work discreetly, and together with any of Nikon’s 1.4x, 1.7x or 2x teleconverters, these photographers can still fill the frame from a very long way away. Both achieving a very good DxOMark score of 34 points, the Nikon 300mm f2.8G ED VR II and the Nikon 400mm f2.8G ED VR are joint winners for best long telephoto prime on the Nikon D750. 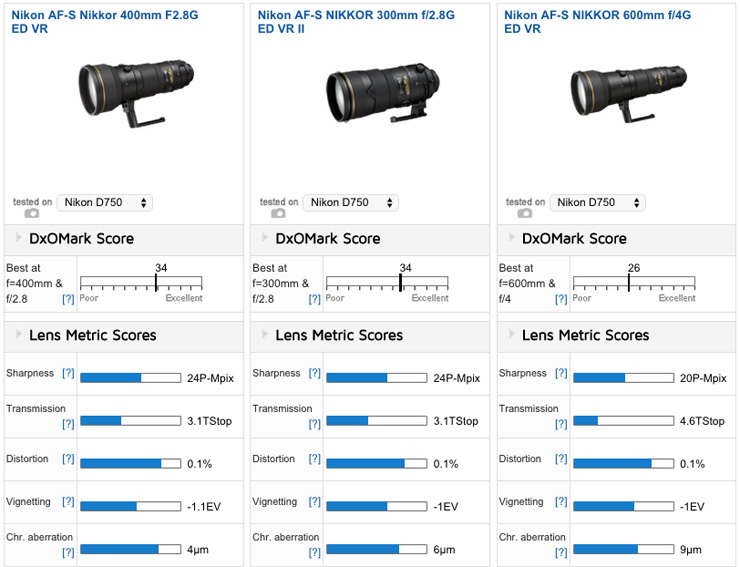 Boasting virtually identical lens metric scores, Nikon’s 300mm and 400mm offer essentially the same image quality, including the maximum Sharpness score of 24P-Mpix on the D750. At all aperture settings up to f/11, both the 300mm and 400mm deliver outstanding edge-to-edge sharpness, and even at the minimum f/22 aperture, it’s still very good. Achieving a sharpness score of 20P-Mpix, the 600mm f4G ED VR isn’t quite as sharp overall, with marginally softer results at f/4, but it’s still very good and homogenous at all aperture settings. Shooting at the crucial maximum aperture setting on all three lenses produces around –1Ev vignetting on RAW files, which requires some post-production correction. Close down just one stop, however, and vignetting is completely resolved on all three lenses. The extra elements required to facilitate such a long focal length affect light transmission on the 600mm, however, which at 4.5Tstop is 1.5 stops’ less light than its 300mm and 400mm counterparts. At the crucial maximum aperture setting, all three long telephoto prime lenses resolve excellent homogenous sharpness, with the 300mm & 400mm just a little sharper overall. Vignetting of –1Ev occurs on the RAW files of all three lenses shooting at the maximum aperture setting, with files requiring adjustment in post-production. Offering a magnification factor of x1.0 or 1:1 at their minimum focus setting, macro lenses enable “life-sized” reproduction of tiny subjects. On full-frame sensors it’s akin to making an impression of the subject on the sensor, which is why macro photographers shoot subjects smaller than the 36mm width of a full-frame sensor. Combined with large-resolution sensors, macro photography makes it possible to capture tiny subjects, such as insects, but print them huge for dramatic effect. If you’ve ever seen a 3m wide print of a beetle or bed bug, it’s pretty disconcerting! The term macro can be more loosely applied to lenses that feature close focus capabilities, but with a lower magnification of 0.5x or 1:2. While not “true” macros, these optics are a good option for general close-up photography of small, but not tiny, subjects. That makes them good for product and pack photography, and macro lenses with focal lengths around 100mm are well suited to portraiture, too, making them a little more versatile than you might have first thought. 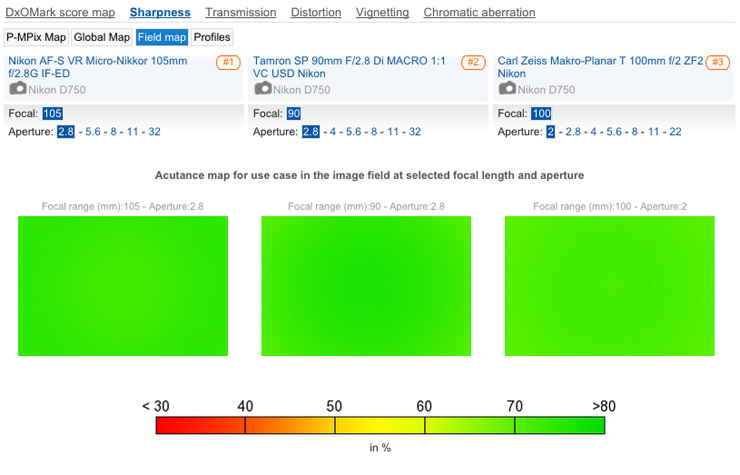 With a DxOMark score of 35 points, the Carl Zeiss Makro-Planar T 100mm f2 ZF.2 wins overall with the best Transmission, Distortion, and Chromatic Aberration results. 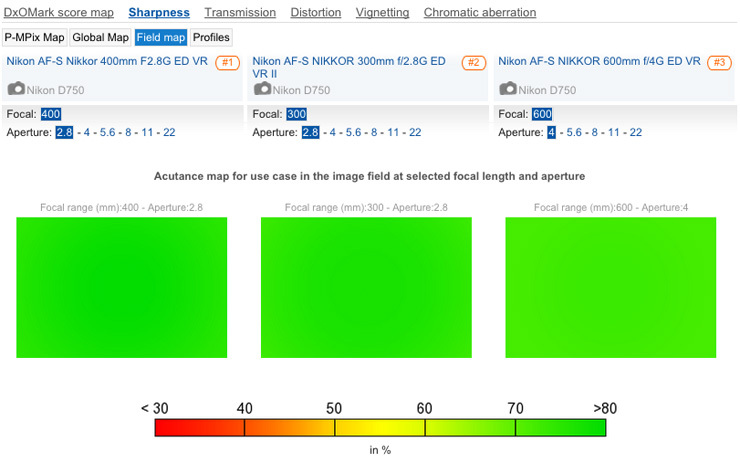 The Zeiss offers only a 0.5x or 1:2 magnification, however, compared to the “life-sized” 1:1 reproduction possible on the Tamron SP 90mm f2.8 Di Macro 1:1 VC USD and on the Nikon AF-S VR Micro-Nikkor 105mm f2.8G IF-ED, which rank 2nd and 3rd, respectively. The Zeiss option features a wider f/2 maximum aperture over the f/2.8 Nikon and Tamron, however, and boasts zero distortion and almost no Chromatic Aberration too. 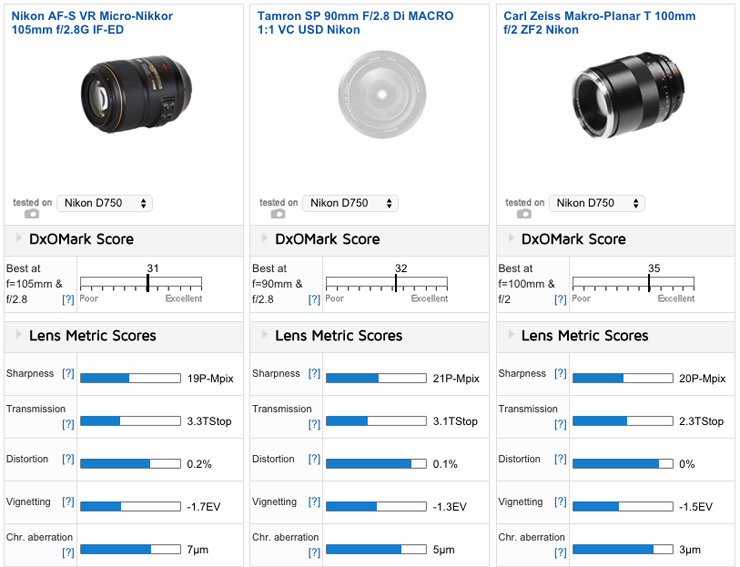 The Tamron macro lens is actually the sharpest of the three overall, scoring 21P-Mpix compared to 20P-Mpix and 19P-Mpix for the Zeiss and the Nikon, respectively. At the maximum aperture setting all three offer good levels of edge-to-edge sharpness, and the Zeiss is as almost strong at f/2 as the competition is at f2.8. Sharpness at the minimum aperture is important for macro lenses, too, as shooting at such close proximity makes the depth of field very narrow. 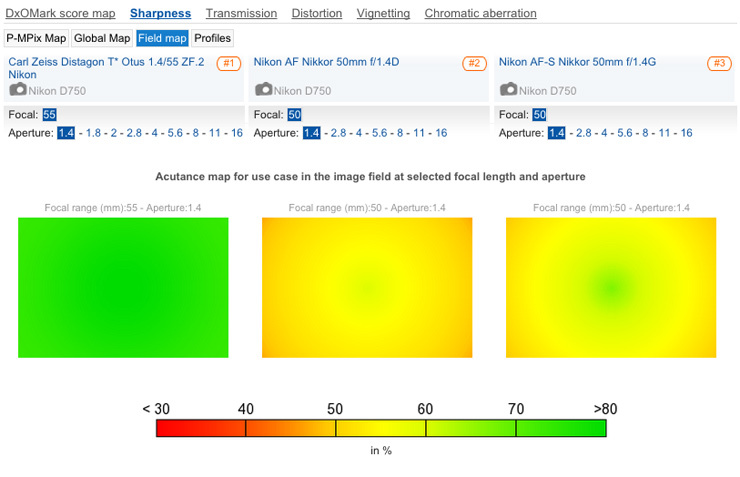 At this setting the Zeiss is the sharpest, although results for the Nikon and Tamron were recorded at the narrower aperture setting of f/32 for even greater depth of field. 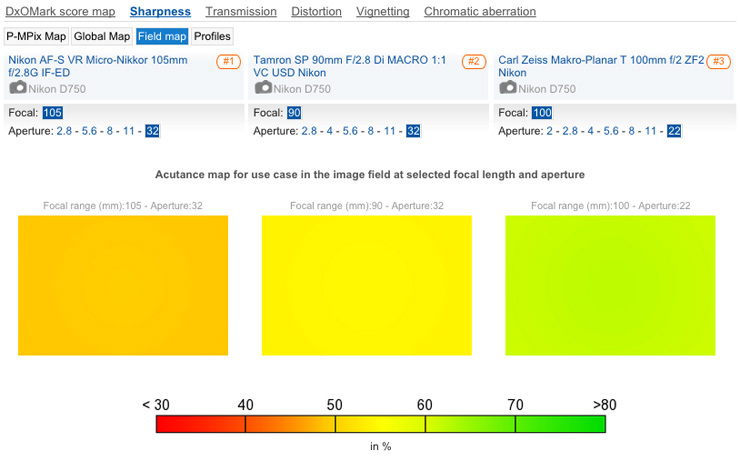 At maximum aperture, the Zeiss 100mm f/2 is almost as sharp as the Nikon and Tamron options at f2.8. 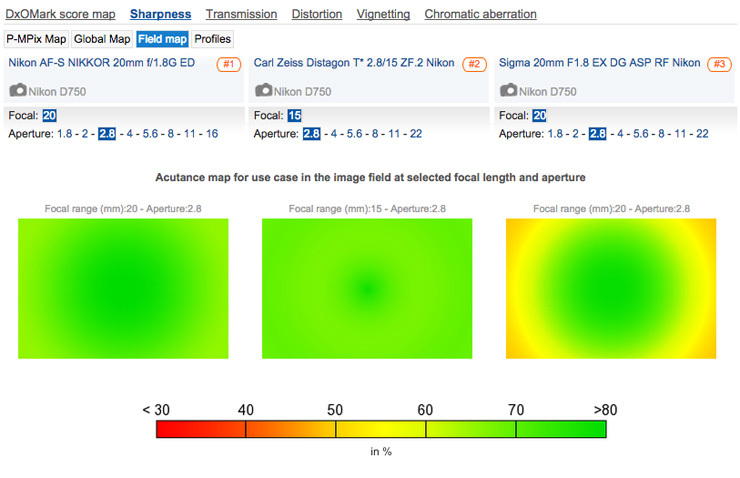 All three macro lenses offer homogenous edge-to-edge resolution. Crucial for good depth of field, the Zeiss 100mm f/2 is sharper at the minimum aperture setting, but the Nikon and Tamron lenses close down an extra stop to f/32.